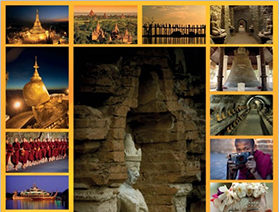 The Golden Rock tour is a great way to extend your Myanmar tour and experience the scenery and life in the area. You will visit one of the important Buddhist pilgrimage site in Asia as you depart from Yangon and make your way to Kyaikhtiyo, the Golden Rock. At this site, a small pagoda stands on a large golden rock that appears to be falling off a cliff. Upon your arrival in Yangon, welcome by our tour guide and transferred to your hotel for check-in. Enjoy private tour and drive through downtown to explore the city centre and its fabulous mix of architecture and sites. The streets are filled with historical buildings many of which have a faded colonial charm not seen elsewhere in Asia. You’ll start at the post office – a lovely historic building, passing by Strand Hotel, Mahabandoola Garden and Independence Monument along the way. Then visit famous Chauk Htat Kyi, home to a 70-meter long reclining Buddha. The feet of the statue carved with traditional symbols and often many locals gathering to pay homage and pray. Photo stop at the Karaweik Hall royal floating barge. Nothing will prepare you for Shwedagon Pagoda, with its glittering gold stupa. At the pagoda observe local pilgrims and monks offering their devotions and enjoy the amazing sunset view at Shwedagon pagoda. Leaving Yangon in the morning, enjoy a scenic journey by road to Golden Rock (Drive via Bago: 194 km – 5 hours). Late morning, arrive at Golden Rock base camp and transfer to transit junction with one of the small open trucks in a one hour ride. The ‘upper area’ must be traveled by foot, at present, and the walk is approximately 4 km (1 hour). Once at the pagoda, you can enjoy a spectacular view, which is particularly beautiful at sunrise or sunset. The whole site has a magical feeling. Overnight in Goldenrock. Early sunrise time, strolling around the hill sites & return to hotel & breakfast there. Then back to base camp by the truck. Arrive base camp, continuous drive to Bago, an ancient Mon capital city. On arrival in Bago, visit to local market. Continue visit to over a thousand years old, Shwemawdaw Pagoda. Proceed to Shwe Tha Lyaung Pagoda, reclining Buddha, which is among one of the country’s most impressive image statue, is 180 feet long and 52 feet high. Then proceed to Yangon on the way sightseeing at Allied War Memorial Cemetery. Day at leisure until transfer to airport. This private tour can be arranged for single traveler, couple, family and group tour. Prices vary according to selected accommodation and season. Please contact us to discuss your individual requirements.